Which criteria do you suggest to measure the susceptibility of bankruptcies (e.g., Chapter 11, 7) for a company in a U.S. equity exchange market (e.g., NYSE, Nasdaq, OTC) that may lower the risks of short-term trading to long-term investing? Bankruptcy is very controversial Google Scholar Researchers. You might track companies ratios (e.g., debt to equity ratio, EPS, net income, cash per share (cash/sh), etc.). 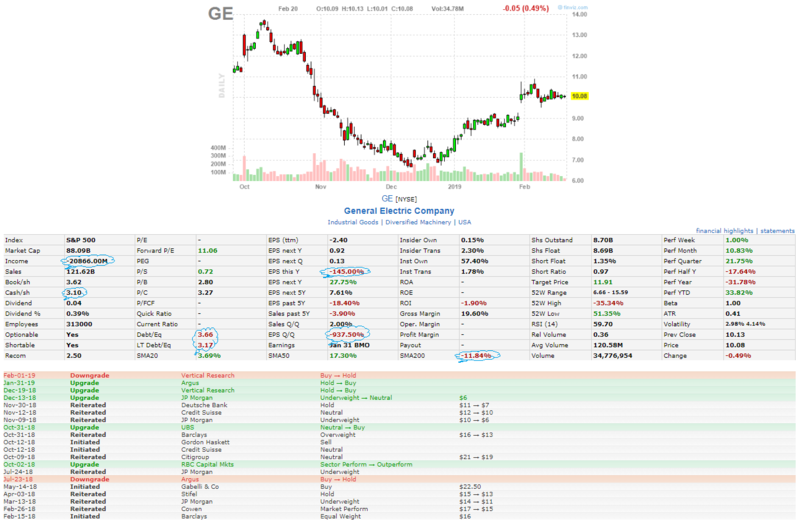 For instance, GE looks almost bankrupt. But, it is not and there is a very low probability that GE would file for any bankruptcy chapter, I'm just guessing. There are many companies, especially in OTC markets, that many investors consider them "bankrupt", but "they are not" and their equities are being traded, e.g. OTCMKTS: HMNY. Usually, theses companies are destined to takeover, involuntary M&As, and so. Also, there are types of bankruptcies that you might take into account, not to mention the complexity of U.S. bankruptcy courts, when it comes to public firms Wikipedia. Majorities of top public companies are incorporated in Delaware, which has a fairly advanced court system to protect shareholders (e.g., Delaware Court of Chancery). Companies in pharmaceutical sector might be good to look into since they usually develop high-risk products that may not succeed. You may use stock screener tools to filter companies based on any criteria you wish and find those that are in serious financial situations. In fact, many small-account retail traders love to trade their equities, since they are usually oversold Finviz Oversold TradingView. Since the stock is listed on NASDAQ, you have access to fairly standard 10Q and 10K financial statements. So you can apply the analysis pioneered by Ed Altman in his Z-score paper - compare this company's fundamental ratios with those of other companies, and see how many of them went bankrupt historically. For example, Moody's KMV uses this approach to estimate "EDF" (expected default frequency) for many corporate credits. Not the answer you're looking for? Browse other questions tagged equities trading market investing debt or ask your own question.